A native of Massachusetts, Lorna Tsai began her studies at the New England Conservatory Preparatory School in Boston at the age of five. Lorna has received recognition for her work, among them from the National Foundation for Advancement in the Arts, the New England String Ensemble, the Concord Symphony and the New England Conservatory Preparatory School. 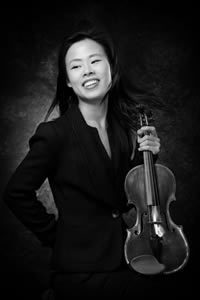 Upon receiving her Bachelor Degree in Violin Performance from Northwestern University, she continued her studies at Yale University School of Music where she earned her Masters in Violin Performance. Previous teachers include Magdalena Richter, Marylou Speaker Churchill, Roland and Almita Vamos and Ani Kavafian. Lorna is currently the Principal Second Violinist of the Calgary Philharmonic Orchestra, serving in the position since Fall of 2011. Prior to joining the CPO, Lorna performed with ensembles such as the New World Symphony and Louisville Orchestra. Lorna has also performed as soloist with various orchestras including the New England String Ensemble, the Concord Symphony, Symphony Pro Musica and the Calgary Philharmonic Orchestra. During the summers, she participates in music festivals which in the past have included the Verbier Festival Orchestra, Artosphere Music Festival, Spoleto Festival USA, Tanglewood Music Center, Pacific Music Festival and Aspen Music Festival. On her spare time, Lorna enjoys looking for food recipes but never following them and contemplating when she’s going to have her next cup of chewy coffee.